My favourite product from the Vinosource range has to be the Moisturising Sorbet. This light, almost whipped, cream sunk into my skin straight away and provided instant relief from my tight, dehydrated skin. One concern I always have when trying out new moisturisers is that it may increase the oiliness of my skin, however the Caudalie Vinosource Moisturising Sorbet effectively hydrated my skin without leaving a tacky feeling behind, and without increasing the oil levels in my skin, making it perfect for the summer months. Another product from the Vinosource range which I've been using a lot lately is the Moisturising Mattifying Fluid, which has been perfect for these hot and humid days we've been having here in the UK. This ultra moisturising fluid has a weightless feel making it perfect for the summertime when you don't want anything too heavy on your skin. The fluid contains flax seed powder which gives you an instant and long lasting mattifying effect, and the added grape seed oil also means that while the fluid mattifies your skin, it won't dry your skin out in the process, as the grape seed oil helps the product to react to your skins natural hydration levels. In addition to this, the Vinosource Mattifying Fluid also contains Vinolevure which strengthens skin over time to become less sensitive and more resilient to the elements. If you need an extra moisturising kick, the grape seed water is also a brilliant extra touch. Much like the Clinique Moisture Surge spray, Caudalie's 100% organic Grape water is a refreshingly cool mist which tones and moisturises the skin, to keep it looking and feeling fresh throughout the day. The mist is enriched with moisturising polysaccharides and mineral salts to provide an instant boost of hydration either under or over your makeup. I wouldn't say that this is a completely necessary product, as it's more of an extra step, but it's been brilliant on these hot and humid days and you just need that little mid-day refresh. 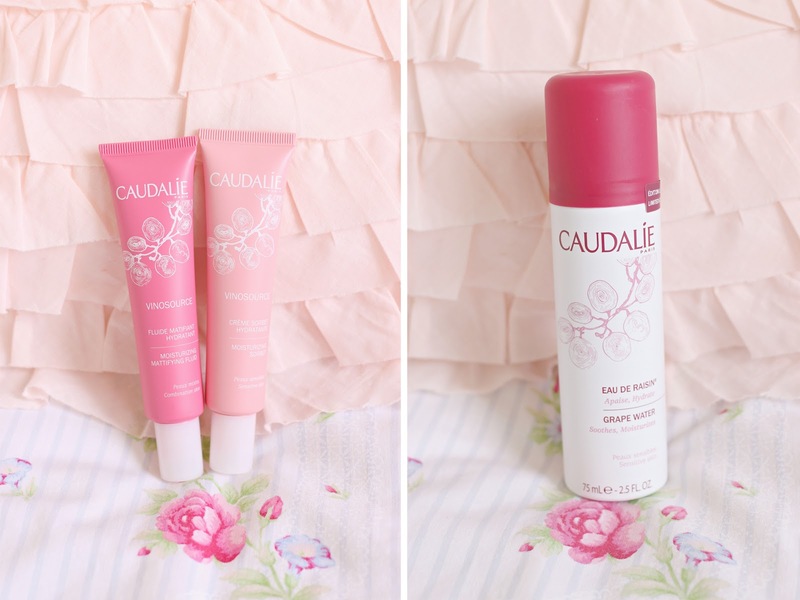 Overall, I've been really impressed with the Vinosource range from Caudalie, and thats something coming from a girl whose been using the same moisturiser for three years. If you're looking for some extra hydration this summer without overloading your skin, I'd highly recommend you try out this range from Caudalie, available here from £6-£23. Been dying to try the new range! These sound so nice and I love the packaging!